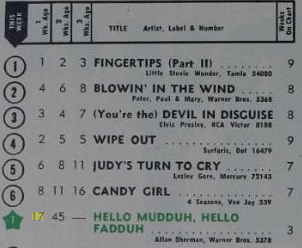 In Aug 1963, "Hello Muddah" was number 45 on the singles chart the week ending August 3. The next week it jumped to 17. And for the week ending August 17 it was number 7. And it kept on climbing. Interesting post. I have been wondering about this issue,so thanks for posting. Matemingler is the number one dating site for singles seeking long-term relationships. Join for free to be matched with compatible singles. Allan Sherman on "Hello Muddah"
Chicago Mayor Proclaims Allan Sherman Day! Hello Muddah Hits Australia in August '63. Well, I Guess I'm an Author!